Ariens Compact – Deluxe – Platinum | What’s The Difference? Ariens Compact – Deluxe – Platinum – Professional | What’s The Difference? Ariens 2-stage snow blowers are unique. Instead of taking one basic machine and adding or subtracting features to change the price, Ariens makes four designs that give you the performance and features you need for your particular yard or job. When you move up one level to another you also move up in longevity. I am going to go through the three designs that work best for homeowners and explain each one so you can make a better choice as to which snow blower is best for you. The Ariens Compacts are designed as lightweight snow blowers that are robust and dependable. A unique feature they offer is the folding handlebars. With the handlebars folded the snow blower takes up less space than your walk-behind push mower. The Compact series only comes in two sizes. The Ariens 22 inch Compact works well for single car driveways and can easily handle 12 inches of snow. The Ariens Compact 24 works well for driveways 2 cars wide and up to 60 feet long. They both have plenty of power and capacity to cut through the drift the city snow plow left at the end of your driveway and throw it far away. Many city homeowners buy the Compact 22 because it has the power to cut though what the city snow plow left but is small enough to fit into your limited garage space. One unique fact about Ariens Compacts is there is very little plastic (Polymers) on this snow blower compared to most other brands. The chute, dash, impeller and handles are all metal. The Compacts are not the easiest snow blowers to use. They do not have trigger controlled power steering or Auto-Turn, but they are lightweight and you won’t notice this very often. If you weigh more than 140 lbs you will be able to easily use this snow blower. The Compact Series does have a system called pin-lock. What this means is during normal use you pull a pin on one of the drive wheels. Only one wheel drives the snow blower but this allows the snow blower to turn easily. When you get hard to move snows or need the extra traction just insert the pin and both wheels pull the snow blower through. This is a very simple and practical method and works well for most of us that get 40 inches or less snow every year. It works very well if you primarily clean driveways and sidewalks. This type of drive is very dependable because it has very few parts to break or wear out. All Ariens Compacts have 110 volt electric start. The chute is all metal and the controls are very simple. One crank quickly turns the chute from side to side. You stop the snow blower to adjust the deflector on the end of the chute. If you have a sloped driveway you may want a heavier machine for more traction, consider the Deluxe models. The Deluxe models also have more aggressive tread tires. If you had a hard time turning your old snow blower or have a bad back consider moving up to the Deluxe with Autoturn. If you sometimes wait until the next day to move your snow and the snow gets packed down the Compact may be too light and you will have to hold the front end down (or add the front weight kit) If you have a driveway larger than 16 by 60 feet I suggest purchasing a larger width snow blower. You can purchase the Ariens Compact through your local Ariens dealer or The Home Depot. Here are the links to purchase the snow blower through The Home Depot. The Ariens Deluxe Sno-Thro series 2 stage snow blowers are a significant step up in clearing size and efficiency. The two features that make this happen is a larger 14-inch, 3-blade high-speed impeller, and twin drive belt design. These features allow you to quickly clear through 16″ of snow and throw it up to 50 feet. You’ll throw more snow in less time so you can get back to what matters. The Deluxe series also is a large step up in features and heavy-duty components. If you are looking for a long life machine that will power through most snow, the Deluxe Series is arguably the best. I’ll go through a few of the features that make the Deluxe series one of the best on the market for homeowners. Auto-Turn™ steering technology: Auto-Turn is a significant breakthrough in using a snow blower. It gives you “power steering” without levers and cables. It is intuitive and easy for anyone to use. The Auto-Turn component itself is bullet-proof and does not wear out or fail. Dual Belt Drive: A unique 2 belt drive system for the auger provides smooth maximum power and less maintenance. Cast Iron Gear Case: The large cast iron gear case is commercial duty with alloy steel gears, synthetic oil and a leading 5 year limited warranty. The case is cross-braced into the housing and gives you a solid dependable snow handling system. It’s the strongest on the market. Extremely Dependable Ariens AX Engine: I really like the available torque on the engines in the Deluxe series. The Ariens AX engines are quickly gaining the reputation as the best in the industry. Electric start, throttle control, fuel shut-off and long life. Use a fuel stabilizer and you won’t have any problems with these engines. Ice Auger Chute Control: The chute rotation control is simple and it works. 2 and a half cranks from one side to the other and 220 degrees of rotation. Locking Chute Deflector: Other brands use friction nuts to hold the deflector in place. The problem with this is the deflector always wants to ride up or it’s too stiff to move. 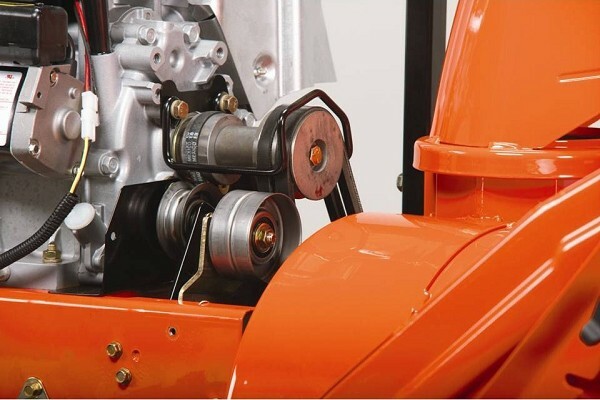 Ariens uses a notched lever that firmly locks the deflector where you want it, yet it can easily and quickly be adjusted if you need to throw your snow closer or farther away. Reversible Skid Shoes: Yes everyone has reversible skid shoes, but these are thicker and will last longer than most other brands. When the bottom side of the scraper shoes start to where they can be flipped over and used a 2nd time. Halogen Headlight: For working in low light conditions to safety at the end of your driveway with oncoming traffic the heavy duty halogen light is an added bonus when you least expect it. Yes, LED’s are all the rage, but if you want the brightest, white light halogen is still the best in class. Optional Heated Hand Grips: The Deluxe can be equipped with heated hand grips. Just slide them on and plug them in. You can purchase the Ariens Deluxe Series through your local Ariens dealer or The Home Depot. Here are the links to purchase the snow blower through The Home Depot. Ariens Platinum snow blowers give you all the robust features of the Deluxe series and add more creature features and power to make you snow clearing more enjoyable and faster. The Ariens Platinum Sno-Thro series 2 stage snow blowers again are a significant step up in clearing power. At this level, the Platinum Series adds big, powerful engines. Coupled with the larger than normal 14-inch, 3-blade high-speed impeller and twin drive belt design these snow blowers have enough power to muscle through any snow quickly and efficiently. These features and performance allow you to quickly clear through all types of snow and throw it up to 55 feet. When running at full capacity you’ll have people stopping to watch these awesome machines throw snow. You’ll throw more snow in less time so you can get back to what matters. If you are looking for a long life machine that will power through any snow, the Platinum Series is arguably the best. All the Platinum models include state-of-the-art features including Auto-Turn™ steering technology, Quick Turn chute rotation, and hand warmers. The Platinum SHO takes snow removal to a level of unmatched comfort and ease. These snow blowers have the reputation of being a smart investment that you can pass on to the next generation. Ariens advertises this series as “The King of Snow” and every feature is built with that in mind! Extremely Dependable Ariens AX Engine: I really like the available torque on the engines in the Deluxe series and the Platinum series adds to this with larger and more powerful engines for the size. The Ariens AX engines are quickly gaining the reputation as the best in the industry. Electric start, throttle control, fuel shut-off and long life. Use a fuel stabilizer and you won’t have any problems with these engines. Quick Turn Chute: The chute is so simple and quick that it took me a few minutes to get used to it. All you have to do is pull back on the joystick style handle a rotate your wrist. It quick. It’s fast. It’s built Ariens-tough. Heated Hand Grips: The Platinum series comes standard with heated hand grips. The industrial grade switch to turn them on and off will last as long as the rest of the snow blower. Large, Tall Tires: Extra large lugs and tall, narrow tires give the Platinum Series the traction you want to power through packed down and hard snow. For a smart investment, you can pass on to the next generation, look no further than Ariens Platinum Series, The King of Snow! You can purchase the Ariens Platinum Series through your local Ariens dealer. If you want the best. If you need a snow blower that will work for weeks at a time without a break. If you wore out your current snow blower in a year this is the snow blower for you. Powerful performance is an understatement. No other walk-behind snow blower can match the dependability and functionality of the Ariens Professional Sno-Thro. 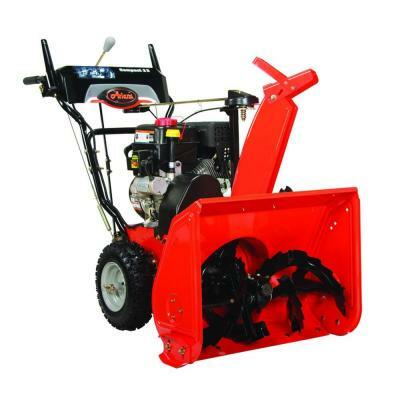 This snow thrower is built large to put you in complete charge of the most intimidating snow from deep drifts to thick, snowplow packed driveways. Hi Jamie, About 40 inches. You don’t lose much height by dropping the handles because the chute control and chute stick up almost the height of the handles. you helped simplify for me an area i know nothing about. i currently have a troy bilt 2410, but i feel it does not throw the snow far enough. do you have a recommendation for me? Hi Sam, The Ariens Deluxe 24 will throw a lot better and won’t plug. That’s my first choice. In fact it will probably throw twice as far most of the time. Your machine has a 179cc engine. 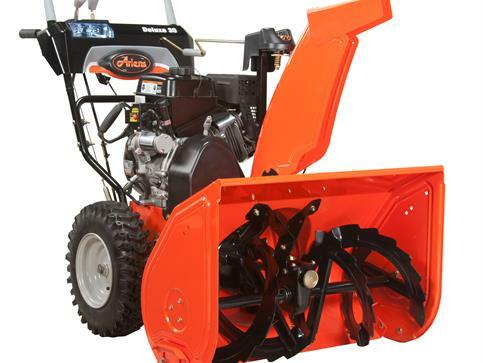 Other 24 inch machines with the 208cc motor will also throw farther, but not as far as the Ariens Deluxe. The Troy-Bilt 2420, Husqvarna ST224, Craftsman 88173, Ariens Compact 24 to name a few. The Toro 724 2-stage will also throw farther. The 24 inch machines that throw the farthest are the Ariens Platinum 24, Husqvarna ST324P, Troy-Bilt Vortex, Craftsman Pro, and Cub Cadet 3X 24. I have a concrete driveway thats 190 feet long, 3300square feet. 3/4’s of it is up hill, quite steep although I don’t know the slope, it does take some effort to walk up it. We average 40 inches of snow annually. I am considering either an Ariens Deluxe 28 inch or an Ariens Compact 24 TRACK. The Platinum Track 28 SHO is nice but a bit more than I’d like to spend unless you feel it’s worth it for my application. My thoughts are the Deluxe 28 has a great reputation, easy to turn. But the slope of the driveway leads me to the 24 track. Drawbacks of the track include reduced maneuverability. What are your thoughts? Thank you for sharing your knowledge! Hi Tony, The two biggest issues with the Compact 24 track is the machine is a solid axle snow thrower. 1st. To turn it you have to skid one track. It’s very, very hard on pavement even with snow on it. I also feel you need to be physically capable of sliding that track around and not losing your footing. 2nd, it small. It may take you all day to clean that much driveway. Don’t get me wrong, I like the Ariens Compact but the track version is a monster to use. Now, Since you only average 40 inches or so the Compact’s residential rating fits but it’s too small and it is hard to use. I also am very concerned about a wheeled unit if the drive is that steep. 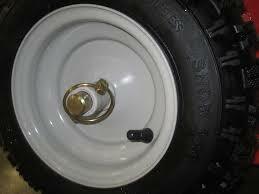 At the very least you will need chains on the tires and poly shoes in front. I suggest you take a look at the Troy-Bilt Storm Tracker 2890 277cc 4-cycle Electric Start Specialty Snow Thrower . 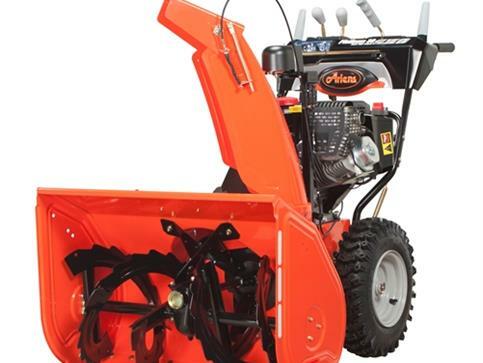 This snow thrower will have the traction you need. It’s a decent size with enough power to handle the occasional heavy snow. And the best part, it has power steering so it is easy to use. It just fits into you budget and will last. If you don’t want the free shipping from Amazon – Lowes also carries it. 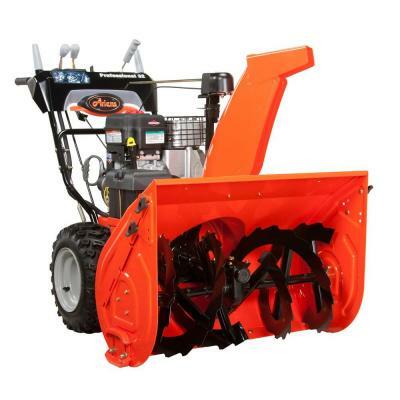 Looking at the ariens 30″ should platium or 28″ pro. Will be using in upper michigan to clear 350 ft gravel drive , maybe 10 to 14 ‘ wide with a nice little hill. 20’ incline in about 300 ft.
Hi J Hurt, I don’t have a preference for those two. They will both require two passes up and down the drive to clear. The 28 Pro is a heavier duty machine. It weighs more than the Platinum 30 and more of the weight is over the tires. This will give it better traction on your hill. You can put chains on either one if you still have issues. Another alternative is the Platinum 28 SHO track. It is a gear drive like the wheeled units and has a 369 cc engine. Price for it is about $2100. The biggest issue with the Track is availability. If you dealer doesn’t have one – he can’t get one until next July.